The wood burning stove or more affectionately the wood stove was a mainstay and center of many a home, giving up dominance as a necessary appliance in the home to the likes of coal, natural gas and electricity. The woodstove gradually lost its dominance on the heating scene bit by bit with the passing years and inventions, the stove and its predecessor the fireplace became more an aesthetic decoration rather than the efficient appliance it is, being relegated to the alternative section. For years the wood stove whether it be the cook-stove, trash burner, pot belly or wood heater were gathering places in the home or even general store where friends and family gathered to warm themselves before the bone soaking heat emanating from the stove. 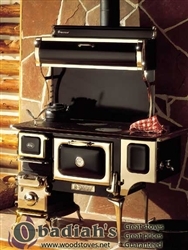 Anyone experiencing the wood stove will surely tell you there is no warmer heat than that of the wood stove. Alas the stove fell out of favor with claims it was a dirty heat, took up to much space, was time consuming to prepare for and all in all an antiquated way to operate. Never mind the old saying heating with wood warms you twice, or that the heat actually felt warmer, or that the fuel it consumes is renewable. No matter the virtues the stove was pushed out into the shed, dump or recycled. Thankfully those wise ones among us who never throw the babe out with the bathwater kept the flame alive. In the course of history thankfully there have been those who see true value, in the late 60’s and 70’s they were called back to the landers or a few other names. I well remember the 1970’s issues of Mother Earth News whose homey pages were stuffed with homesteading and what we now look at as survival and prepper skills. The Wood Stove graced the pages frequently and a resurgence of the wood stove flourished and has waxed and waned over the past 30 years. Today the wood stove, an even more efficient and economical heat source is keeping pace with industry standards and is in fact replacing those heaters that once pushed it out. Join me Sunday to learn all you can about the relic of the past that is preserving the future. Wood burning and alternative energy guru Woody of Obadiah Stoves joins the Other Side to give you the ins and outs of wood burning and more. Are you contemplating a change or addition to your home heating and energy needs, this is your chance to get the facts. Listen to this broadcast on Wood Burning 101 and Alternatives in player below! You listen to archived shows of all our hosts . Go to show schedule tab at top of page! Wood Cookstoves; The alternate source to your everyday life. 1 Comment on "Wood Burning 101 and Alternatives"
Love the work you do, however, Iwhat do you know about Rocket Mass Heaters?? They are, from my research, the most efficient thing out there. You burn about 80% less wood. And. You can build them in a weekend for $200-$250.